PART 1: VORTICE If you’re familiar with the PTY nightlife scene, you’ve probably been to a Vortice or two. Vortice is the name for a party Mairena and her two friends have been organizing and hosting since 2004. Nowadays, the party is thrown thrice a year, always at a different Panama City venue. When Vortice started, Mairena was in charge of advertising and decorating the parties, but is now its creative director. Vortice has been going on for eight years, but the party people are definitely not sick of it. Mairena explains why Vortice is always held at different places: “We want people to remember the experience of the party, not the place.” True, true. The theme of last month’s Vortice (which was awesome, we might add) was mod. “I love pop art and I love Andy Warhol and the New York scene of the 60s, so I’m very in touch with that. And I was so picky,” Mairena explained, giggling. “I hired a friend [to do decorating], and I was like I want that like that, and I want that like that!”Look out for Vortice’s annual Halloween party, which Mairena says is always their most crazy. “It’s always a costume party. Always big, big, big, ones, and we do them in big big big places.” Well, that settles it. There’s our reason for re-visiting Panama next fall. PART 2: LATERAL: Mairena and her friend Carla Garcia de Los Rios (who currently runs Hoja de Bijao) hit on the idea for Lateral in December 2010. They imagined a publication that would cover creative types not just from Panama but from all over Latin America. “Everytime you hear about a very good designer they are from Spain, or the States, or England. I don’t want to say no to that but I started thinking okay, we have a lot of good designers here too,” Mairena said. The name’s a reference to both the creative lifestyles Mairena seeks to cover and the original side-project status of Lateral. “The thing that’s right al lado de tuyo,” Mairena said about the title, “I used to work 9 to 6. My projects were my lateral activity – not work based.” Plus she said she wanted the name to be some meaningful and more importantly, to be in Spanish. “ The first print edition was published in 2011. 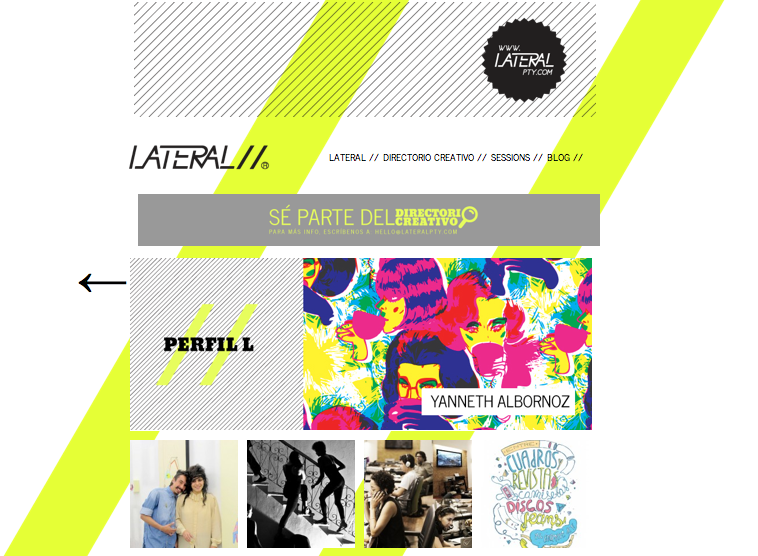 I happened upon Lateral’s website one late night right before I moved to Panama City, when I was panicking just a little bit that there wouldn’t be any kind of art and culture scene in the city. Lateral, with its killer design and well-written coverage, was the best reassurance I could have found. After two print editions, Mairena realized that shipping paper copies was not the best way to create a cross-countries magazine. “I shipped stuff to Costa Rica and Guatemala, but it was like too much money and time,” Mairena said. “I thought to myself, what I should do? and I was like no, I’m going digital. It isn’t only about the money, it’s about getting your information out there.” Lateral’s website just relaunched with a new design just last week. Mairena is also starting a local gallery in collaboration with Hotel Decapolis. Starting in June, the restaurant Brava Pizza & Espuma will project works from a different digital artist every month ‘til January. MM: So we want to tell you a little about an event we’re doing on June 9th at Terrae. It’s a clothing trade called Ropa Vieja, where everyone brings their old clothes, we organize it and then you can take what you like. So what do you have lingering in the back of your closet? MB: I like things a lot. I’m not a coleccionista, but I like things. I have so many pieces of jewelry, so many little things. I have a lot of accessories that I don’t use that much now, but I still have because I think it’s coming back. MM: We ask everyone about their recommendations in Panama City, so, anything that you would recommend in Panama City? MB: I love Via Argentina. I think it [has a] very not-Panama style, in that people live there, but there are [also] a lot of coffee shops, like in Mexico City or Buenos Aires. You can feel the soul of the city. 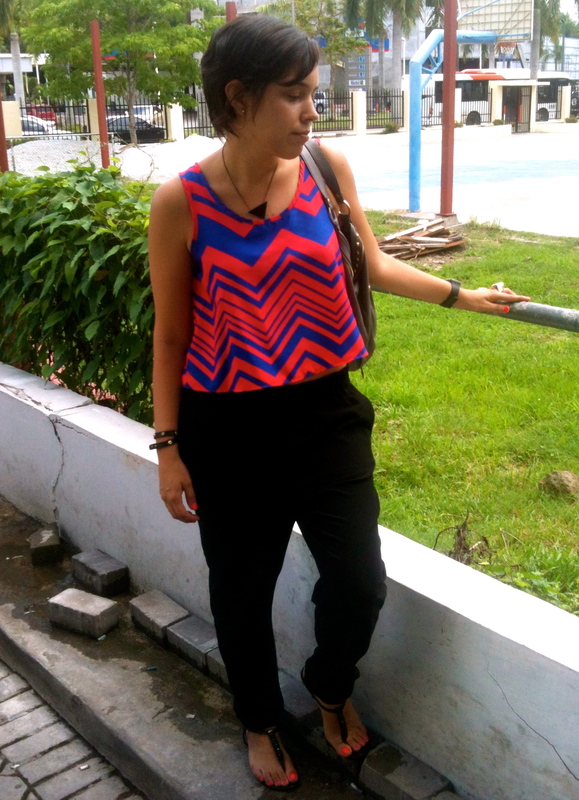 I love walking around, here [in Panama] you don’t see that so much. The classic stores like Espacio Vintage, La Botica. You should definitely put in Sak’s. MM: [Redacted 10 minute story of Eve buying a full red linen suit for under $5 and Christina getting a $400 silk blazer for $8.] Oh my god we love Sak’s. And Dorian’s.